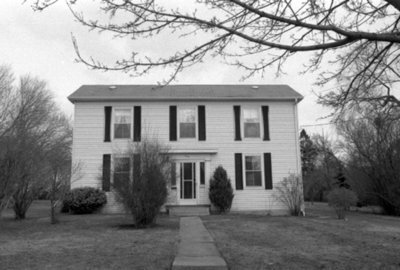 A black and white photograph of 1600 Brock Street South. This house was built circa 1854 for James Cameron a retired farmer who settled on the site of the Ontario Hospital lands in 1831. His son, Donald Grant Cameron then owned the house, and in turn, Donald Cameron's daughter Clara (Mrs. Charles Bottomley) owned the home. Legend states that the house was originally two houses joined together. 1600 Brock Street South, c.2006, Carl Ferencz. Whitby Archives A2013_013_017B. Scanned for black and white negative.